Dimensions 1 by 5.25 by 8.25 in. The author of the breakthrough bestseller Emotional Intelligence demonstrates that emotional and social skills are more important than IQ in determining an individual's success in today's business world. Reprint. Amazon.com description: Product Description: Do you have what it takes to succeed in your career? The secret of success is not what they taught you in school. What matters most is not IQ, not a business school degree, not even technical know-how or years of expertise. The single most important factor in job performance and advancement is emotional intelligence. 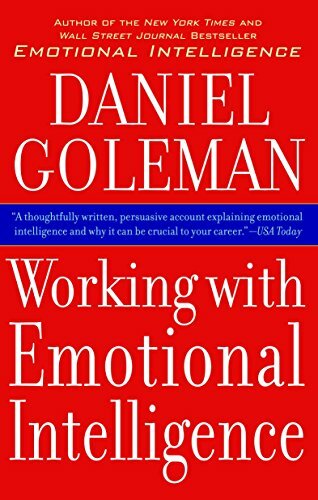 Emotional intelligence is actually a set of skills that anyone can acquire, and in this practical guide, Daniel Goleman identifies them, explains their importance, and shows how they can be fostered. For leaders, emotional intelligence is almost 90 percent of what sets stars apart from the mediocre. As Goleman documents, it's the essential ingredient for reaching and staying at the top in any field, even in high-tech careers. And organizations that learn to operate in emotionally intelligent ways are the companies that will remain vital and dynamic in the competitive marketplace of todayâand the future. Comprehensively researched, crisply written, and packed with fascinating case histories of triumphs, disasters, and dramatic turnarounds, Working with Emotional Intelligence may be the most important business book you'll ever read. Drawing on unparalleled access to business leaders around the world and studies in more than 500 organizations, Goleman documents an astonishing fact: in determining star performance in every field, emotional intelligence matters twice as much as IQ or technical expertise. Readers also discover how emotional competence can be learned. Goleman analyzes five key sets of skills and vividly shows how they determine who is hired and who is fired in the top corporations in the world. He also provides guidelines for training in the "emotionally intelligent organization," in chapters that no one, from manager to CEO, should miss. Working with Emotional Intelligence could prove to be the most important reference for bottom-line businesspeople in the first decades of the 21st century. About: The author of the breakthrough best-seller Emotional Intelligence demonstrates that emotional and social skills are more important than IQ in determining an individual's success in today's business world. About: Demonstrates that emotional and social skills are more important than IQ in determining an individual's success in the business world.